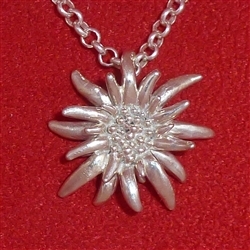 Edelweiss Pendants are available in a variety of sizes to match your Edelweiss bracelets and earrings. Additional sizes and configurations to be listed soon. 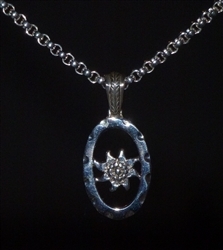 Ladies' Extra Large Edelweiss Pendant, aproximately 18 X 28 mm on a 3mm 18 inch heavy Rolo chain with Lobster Clasp. All in .925 Sterling Silver. Can also be configured with smaller Edelweiss pendants and light Rolo Chain. 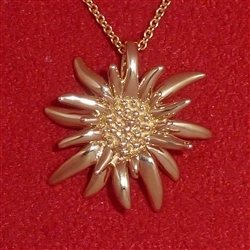 Ladies' Medium Edelweiss Pendant aproximately 25mm (1.0 inches) square. Included is a 2 mm Rolo chain with Lobster Clasp. 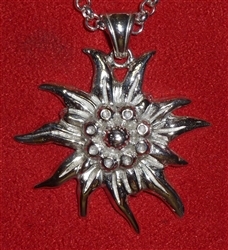 Ladies' Large Edelweiss Pendant aproximately 40mm (1.6 inches) square. Included is a 3 mm heavy Rolo chain with Lobster Clasp.